Features hand torn. No scissors needed. Less adhesive residue compared to packing tapes. Plastic padding. No heavy metal, such as halogens or lead, in the tape's raw material. Distinctive 'pink' color for easy recognition. Standard Safety Grip anti slip abrasive tapes - 50mm. We have carved a niche amongst the most dominant names in this domain, involved in providing superior quality range of Abrasive Tape. We bring forth an extensive range of Adhesive Barrier Tapes that are widely used in different commercial and residential purposes. These tapes have high elasticity and are dimensionally stable. These are high quality self adhesive diagonal strip hazard tape that have high grade PVC. Hazard Warning tape conventional usage. Enriched with our huge industry experience, we are an established name in supplying a vast range of Abrasive Tapes. Offered by us, these tapes are procured from top-notch manufacturers of the industry. Manufactured using high quality material and modern equipment, these tapes are available in different sizes and specifications. To fulfill the diverse requirements of our clients in best possible manner we are offering Abrasive Polishing Tape. Fostered with rich industry experience, we are engrossed in providing Abrasive Tape. SVMT not only offers product and pricing options for any level of user application, but we also offer depth of experience for a total commitment to your Abrasives solutions. No matter what your cutting, grinding, stripping, sanding, or finishing need, SVMT delivers. 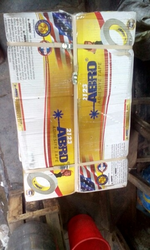 We are a most trusted name among the topmost companies in this business, involved in offering Abrasive Tape.